Camping de Tournon HPA si trova a Tournon-sur-Rhône, Ardèche, è situato fiume/torrente. Questo campeggio dispone di piazzole delimitate, sia ombreggiate che, senza ombra e piazzole poco ombreggiate. È possibile affittare casemobili e bungalow. Ogni anno un ispettore visita il Camping de Tournon HPA, controllando oltre 200 tra attrezzature e altri punti di interesse del campeggio. L'ispettore è un dipendente ACSI e non lavora per il campeggio. Small site tucked down a side street. Nice view of the Rhone. The pitches, as you might expect, are quite small. Almost impossible to get your van, awning and car on, fine for a motor-home.Showers are heated but dated and not as clean as they could be. I found cob webs and dead spiders. The Wi-Fi is free. I'm at one end of the site, and i can pick it up. Being 'in' the town it can be a noisy. Local teenagers revving up mopeds spoilt my first night sleep, the following morning almost every one left. I don't know if the two events where related. The next morning a tanker 'hummed' nosily while it filled a pleasure cruiser with diesel next to the site. The town has a couple of pleasurable walks and shops are within walking distance. This site was recommended to us by a motorhomer on another site. Many of the pitches on the banks of the Rhone were more suited to motorhomes and indeed some of them were specifically restricted by the site for them. We managed to put our 8 metre twin axle on a nice pitch overlooking the river though and enjoyed our time there. Many pitches are hardstanding of a sort but our pitch was quite long grass and mud because there had been a lot of rain and the turnover on pitches was so quick they did not have time to cut the grass. The toilets and showers were clean, tidy and the water was hot. The block is a little dated but very acceptable. Limited water points and other basic facilities which were dotted around. Well sited site from which you can walk in to Tournon and across the river into Tain Hermitage. We found the site to be very transitory with many only staying one night. We were there for four nights and planned to stay longer but found that a group of 32 French motorhomes were due in and would be surrounding us. As the site manager was concerned on how he was to find room we volunteered to go!! Unlike another review listed in September 2014 we did find the managers quite helpful and pleasant but, catch them on the wrong day and who knows!!! We will definitely return but without a pitch overlooking the river we would not stay too long. There is plenty to see in the area and a trip on the train d'Ardeche is a must and a visit to Hautrives to see the creation of Facteur Cheval should be included. Lastly don't miss the chocolate shop in Tain. We did therefore we must go back. A nicely positioned camp site spoilt by the aggressive site manager who seemed to feel his only job was to pack as many people in as possible each night. Not only that but the facilities are way below par for a camp site. Suitable as night halt only would be our opinion and that is what it seems to be used for mostly. Staff very friendly and site in a good position for the town and not to noisy. Right on the banks of the Rhone. Toilet block clean but very tied pitches not to bad. Surrounding area beautiful and well worth exploring. Volete prenotare il Camping de Tournon HPA o oppure saperne di più? Potete farlo usando i seguenti dati. A7 uscita 13: Tain l'Hermitage. A rotatoria direz. Tournon-sur-Rhône. Tramite RN7: attraverso ponte per Tournon, girare a destra e seguire il fiume. Poi in centro dopo ampio parcheggio subito a destra e seguire cartelli. 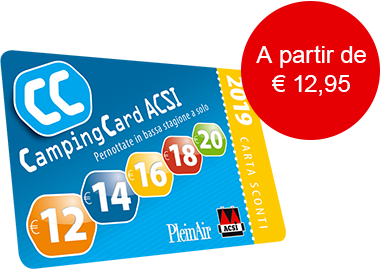 ACSI Eurocampings invia la tua richiesta di informazioni al "Camping de Tournon HPA".